An Exclusive Legal Educational Seminar for Municipal Elected Officials & Employees Only. Efficient and effective land use planning and development practices can ensure that your municipality is open for business. This session will focus on real life success stories and strategies to encourage development in your community, from how to streamline your processes to ways to ensure timely development. Implementing economic development concepts and projects requires the development, establishment, and evolution of relationships - whether it’s with local businesses and other public entities within the municipality, or regional municipal partners and service providers, First Nations, or beyond. Eventually the concept must be taken to reality through formal agreements, governance structures, and associations that ensure and deliver upon the promises. What are the tools to give you, your project, your partners, or your neighbours, what they need? A municipality has broad taxation powers that when used effectively can increase revenue for a municipality while still encouraging growth and economic development for long term sustainability. This session will include a discussion on the effective use of taxation powers; how to encourage an increased assessment base; the do’s and don’ts of business incentives; and how to make the best out of a difficult situation when a downturn in the economy makes tax recovery a reality. Municipal procurement can be complicated. Success is not always guaranteed by accepting the lowest price. Successful procurement depends on many factors. This session will provide a refresher on best practices for municipal procurement as well as providing attendees with thought provoking concepts including better defined project requirements and quality based evaluation criteria that are designed to maximize procurement dollars and deliver successful outcomes. 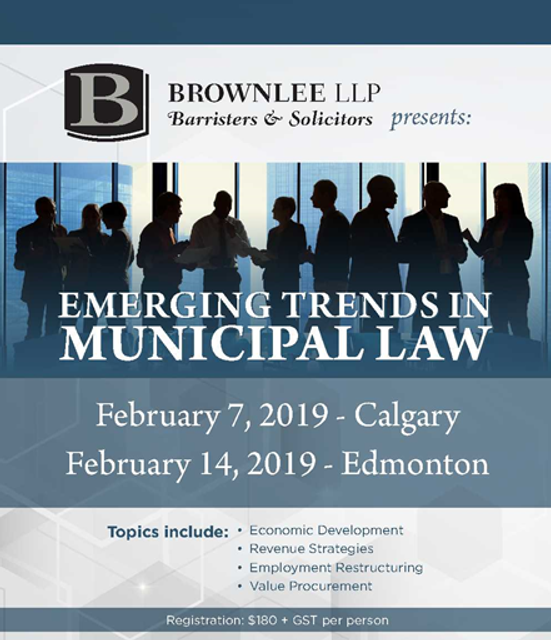 As municipalities consider and implement organizational change it is important to understand the potential pitfalls and risks in the employment and labour area such as severance cost, constructive dismissal, and collective agreement terms and restrictions; and more importantly to make use of key tools to assist with implementing such change with minimal risk and cost such as working notice, layoffs, negotiating consent, and contracting out.